QuikClot® Advanced Clotting Gauze is made with Kaolin, the same homeostasis technology used by the US troops to stop even the worst external traumatic bleeding wounds quickly. 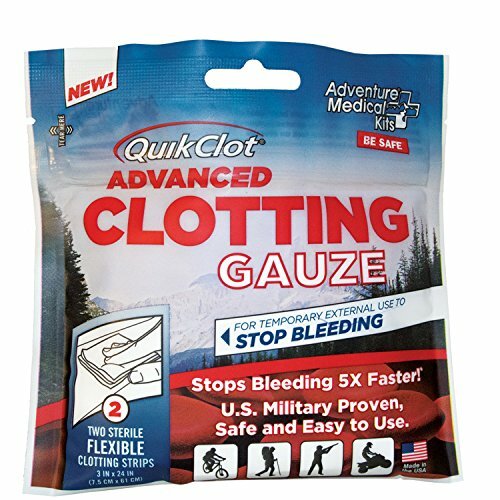 Each QuikClot® Advanced Clotting Gauze is packaged in an easy to open foil pouch to keep the gauze free of contaminates. The easy-to-use dressing can be contoured to fit any wound and can achieve homeostasis in as little as three minutes. It's ideal for hiking, backpacking, rock climbing, mountain or road biking, camping, expeditions, adventure travel, hunting, fishing, off roading, emergency prep. 2 Pack.Includes Two 2 - 3" x 24" long strips. If you have any questions about this product by Adventure Medical Kits, contact us by completing and submitting the form below. If you are looking for a specif part number, please include it with your message.